Tallulah’s eye infection is on the mend, and Bugsy’s walking has improved, although he is still wobbly. Here they are at a local pug meet-up last weekend! Last month we were contacted about a pair of older pugs who needed to be rehomed, because their owner was moving house and wasn’t able to take the pugs with her. Bugsy and Tallulah had been adopted from a general rescue by the surrendering owner just over a year ago. Their history is largely unknown, but it seems that they had originally been surrendered to the general rescue following the death of their previous elderly owner. It is also possible that they might already have been rehomed and then returned. The pair were duly collected and immediately put into experienced foster care. We had been told that they were brother and sister, aged approximately 7 years. It soon became apparent that they were both older than that – more likely 9 or 10. Both were overweight, and Bugsy clearly had spinal issues. They visited the vet the next day for booster jabs, worming, flea treatment and a general check over. 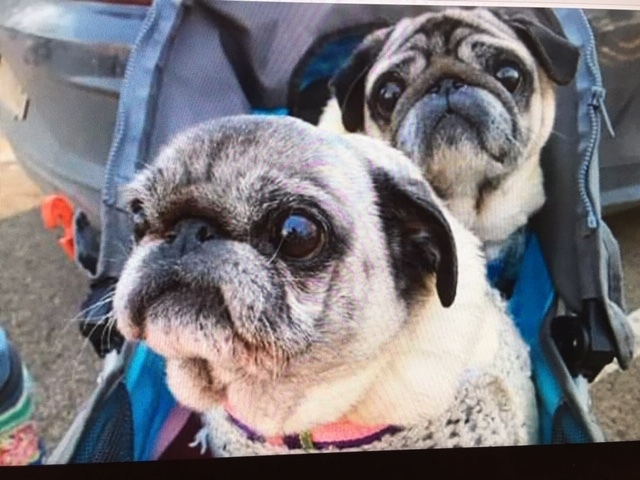 Both pugs had very dry eyes; Tallulah was reasonably mobile for her age, but Bugsy’s spinal issues were exacerbated by his weight and lack of exercise; he was finding it difficult to even wag his tail. Within a few days of being in foster care, on a certain amount of medication and a controlled diet (portions strictly measured out) both pugs began to gain in mobility (frequent little walks round the garden) and in confidence (meeting and playing happily with their foster carer’s daughter’s pug, and enjoying lots of attention from other friends who visited). Fast forward another 2 weeks and here they are in their puggy buggy, attending a local pug meet up and walk. 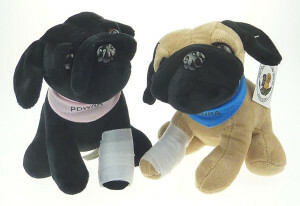 Both pugs were able to walk part of the way, and enjoyed cuddles and attention from lots of admirers. “I can’t believe it’s been 2 weeks since taking these precious pugs into my life. They are adorable, we are now 3 old pensioners out for a daily walk”.